Mobility of the arms and shoulders is essential for a safe, strong workout. Before diving into a swim routine or a game of volleyball, it’s smart to warm up your upper body. 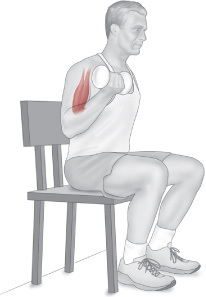 Any activity that uses the arms and shoulders could cause injury if those muscles aren’t properly stretched out. With your feet shoulder-width apart, hold your arms straight out to make a ”T” with your upper body. Make clockwise circles with your arms, starting with a small range of motion and working up to circles that use your full range of motion. Do 10 to 15 reps, and then reverse direction. For a more intense warm up, start slow and then ramp up the speed to fully engage the muscles you’ll use for your workout. Do this for 10 to15 seconds.